This blog tells my story. I write under an adaption of my first name... my preferred name, ‘Kimmie’, a pet name given to me by my Nan years ago. My scribbles include my experience of mental illness and gambling addiction. My fear and isolation as a child! My relationship with GOD, with my children and with my mother. Good and bad days past and present, life in general, and occasionally a little of my nonsense! Where ever my muddled mind takes me! It’s all relevant, Its all me. I love GOD, I really do; but disturbing, often vile intrusive thoughts (a symptom of O.C.D) can make my relationship with GOD extremely difficult! I am a compulsive gambler (in recovery) much more on that later, but for now in brief…. And the wheels keep on turning. Sandwich to the left of me, dry, untouched! And the wheels keep on turning! So sick and tired of feeling sick and tired! Can’t stop if I’m losing, can’t stop if I’m winning. I am both full time carer, and full time dependent. In short I care for my disabled daughter with hubby’s help, and hubby cares for us both, with no help! 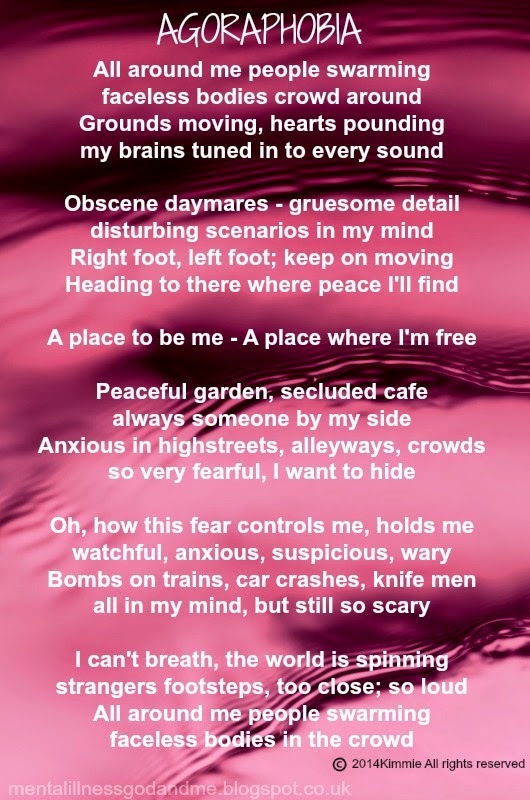 I have lived with mental illness for as long as I can remember, hospitalised twice in early adulthood with severe depression, and more recently diagnosed with O.C.D (obsessive compulsive disorder) which makes me feel a bit like this 'STUCK - IN - SCARED'. Much more on that later! I also have a diagnosis of G.A.D (generalised anxiety disorder) which causes me, at some point everyday, even the good days; varied levels of anxiety, and exacerbates facial and body tics, which vary in severity from mild to severe. PARANOIA which is probably related to OCD, although I’m not a doctor so I could be wrong about that. I do know that in my case paranoia affects my ability to trust anyone completely, even my husband who I love with all my heart. More on that later I think, it’s not easy to explain in short. And last, but by no means least (for the past three years or so) an eating disorder - probably the most terrifying symptom of mental illness Iv'e experienced yet, and the one I find the most difficult to write about. 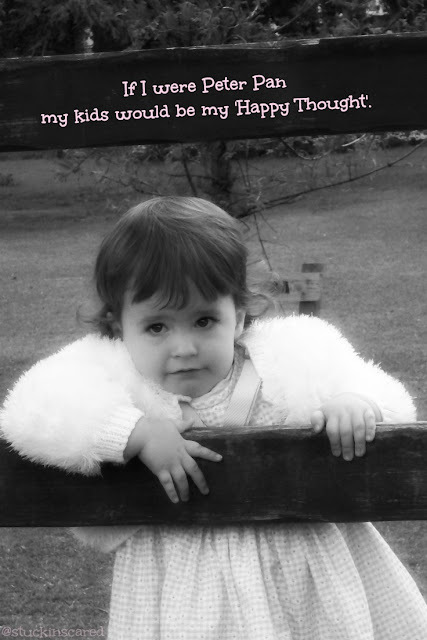 I have five children, including one with complex special needs. They are all amazing, I love them so much and can't wait to share them with you. 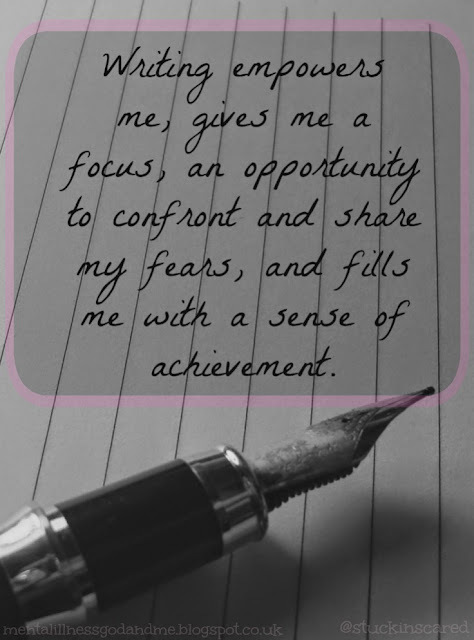 My Occupational therapist was right; writing does offer some relief from anxiety but much more than that, it empowers me, gives me a focus, an opportunity to confront and share my fears, and fills me with a sense of achievement. Maybe one day I’ll write that book Iv'e been harking on about for years, Maybe I‘ll never get around to it! Maybe, Maybe, Maybe, Maybe! (Sorry about all the maybe’s one wouldn't have made my point, and two or three would't have been four!) now I need one more because I see a total of seven in this paragraph, so here it is - maybe all that really matters right now is that I’m writing, and it feels great! I am Me - I'm loving, kind, empathetic. Compassionate, generous, passionate. Creative. I have a fabulous imagination, a child-like way about me (not always a good thing), a wicked sense of humour, and a heart for the hurting. 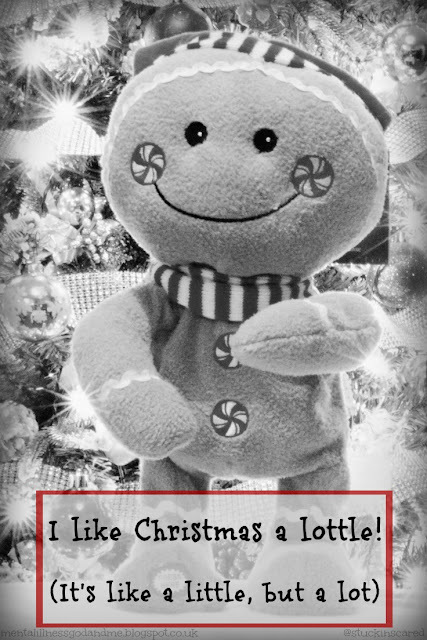 I like Christmas, a lottle (that's like a little but a lot). I'm obsessed with Betty Boop; there may be more Boops in my house than there are in the Boop-Shop. I love: the sound and smell of the rain, the sun on my face, sand between my toes. Sausage meat between my fingers (that's not as mad as it sounds). Paddling. Puddle jumping. Mud between my toes. Being with my kids. Cappuccino! I hate: Cruelty. The current UK Government. War. Greed. Fish (unless it's cod...cod's okay). Oh, and the wind; I HATE the wind, it's so... so irritatingly-windy! Lord, I pray that by my telling-it-how-it-is I might help myself and other mental health sufferers feel less isolated, and at the same time help mental health professionals and society in general gain better understanding of what it feels like to live with mental illness. Amen. YAH! After days of obsessing, counting, checking, and constant rewriting I’ve finally completed this blog! I feel a WHOOP coming on! If you have made it this far down what can only be described as an extremely long 'me me me' post, thank you for sticking around. 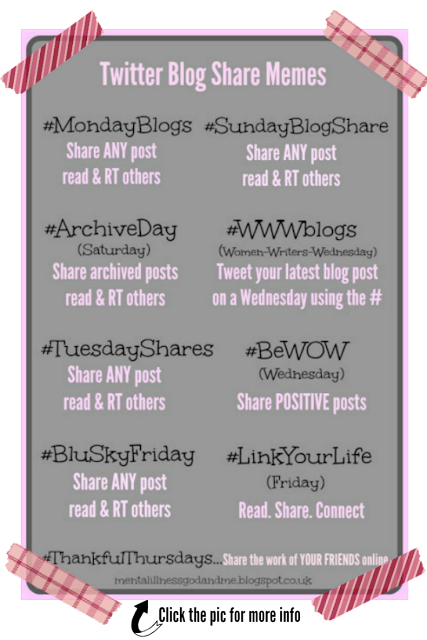 It helps me to share, I hope that somewhere in my ramblings you find something that helps you. Love the upfront, 'take it or leave it' attitude, Kimmie. You are a born survivor and thriving in spite of the great issues in your life. If anything, they give you a lot of empathy, understanding and compassion that flows from your writing. In a situation that could easily degenerate into a 'poor me' diatribe, you manage to find a mix of pathos, humour and light. I can't believe I barely stumbled upon this blog. It's good to see such honesty, despite such troubling circumstances. I have never been diagnosed with any mental illnesses, but I certainly know what it is like to struggle with anxiety. I look forward to reading more of your posts. God bless! Thanks so much Javier, it's lovely to (virtually) meet you. I read one of your blog posts earlier..via #MondayBlogs, and gathered from it that you struggle with anxiety, and yes, I agree..it is a struggle. I am so glad you posted on Once Upon Your Blog so I could follow the breadcrumbs back to all of this wonder. You're an exquisite writer and in exquisite pain. I've been in the latter and the former really is cathartic. I look forward to following your marvelous work. Thank you Stephanie, I read your comment on my 'I am' post, on 'Once Upon A blog', - thanks for the heads up there.. it's always nice to put a name to an anon :o) .... such an encouraging comments, both there and here. Thank you! Thanks for sharing this... I never realised this was "anonymous" and Kimmie wasn't your "real" name! How odd. Now I think about it, I suppose I've never seen a picture of you! 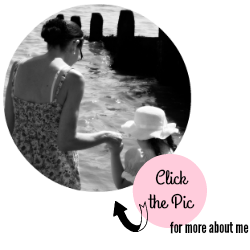 There are one or two pics of me on the blog.. but only back views. I'm more comfortable writing the difficult stuff if my face isn't out there. Nice opening post,Kimmie. Writing makes for great therapy. What a beautiful introduction! I have just found you. Your profile is like my dog Angus.Nice meeting you Kimmie. Hi Thelma, it's nice to (virtually) meet you too. :) Thank you so much for stopping by, and for taking the time to leave such a lovely comment. Agreed with lizzi. Love the new look!! Thank you for sharing so openly, Kimmie. I'm surprised I haven't read it before, but perhaps it's a good thing, cause I enjoyed reading it today. It is lovely to get to know you a little better. I love honest posts - nobody is perfect and most of us have underlying issues that we are slowly working through (some have more than others!) Sharing and connecting certainly help and it's lovely that you are being brave enough to open up and start a conversation. Yes. You're right... we are all a work in progress. 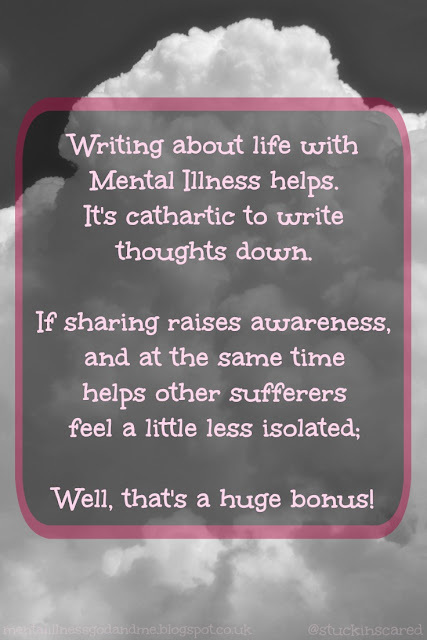 There is catharsis in the writing... and connecting with others, either through their own blog-shares, or here in response to my own posts really does help. Some of my loved ones have mental illness and I know it is a hard road. Your honesty is admirable. Sending many blessings and much love to you all. Wow.. I love it. Congratulations on getting this far and being so honest. :) Have a great day! 'ASPIRATIONS OF A BENEFIT SCROUNGER! MY FIRST HUSBAND WAS A WEREWOLF! Don't stand too close to me!